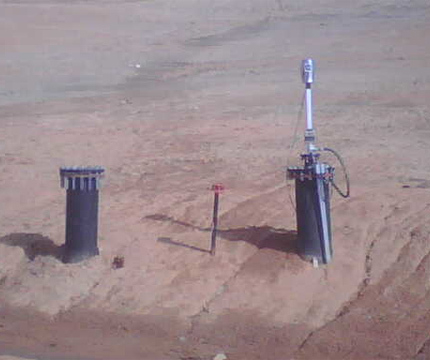 Blackhawk reciprocating piston pump systems pump hot, viscous liquids such as coal tar, gasoline, and fuel oil/water mixtures commonly found in groundwater remediation pump sites. Heavy-duty Viton seal plates and downhole seals are chemically resistant and ideal for use with any remediation pump. Blackhawk’s positive-displacement piston system is a simple industrial-quality syringe, which gently suction hydrocarbons or other chemical liquids with steady efficiency without disturbing the product environment. Blackhawk’s above-well reciprocating pumps pull up a broad range of sinking products, including hot, viscous and corrosive liquids in deep holes and challenging climatic conditions. There is no down-well electricity or high-pressure air injected into the well; electric models can be made explosion proof. All servicing is safely above grade. No add-on equipment is needed. Contaminated liquids lighter than water are suctioned with a one-tool attachment to any of Blackhawk’s low-flow remediation pumps. The simple and economical floating skimmer draws in oily liquids with only minimal water. Unlike other pump styles and brands, our universal skimmer is the only add-on needed. The universal skimmer attachment gently removes a variety of floating viscous products (LNAPL). Multiple skimmers are not needed.